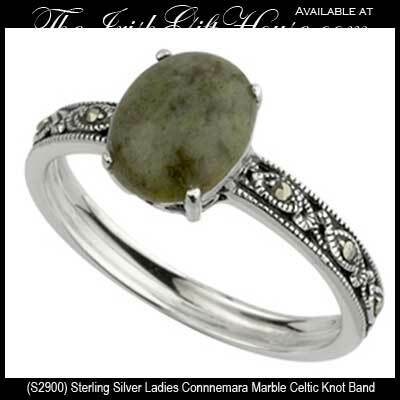 Sterling silver Celtic ring features a Connemara marble setting along with an engraved band that accented by marcasite stones. This sterling silver Celtic ring features a 3/8" wide Connemara marble setting along with a 1/8" wide band that is enhanced with both marcasite stones and oxidized accenting. This Irish ring is gift boxed with Celtic knot and Connemara marble history cards, complements of The Irish Gift House. 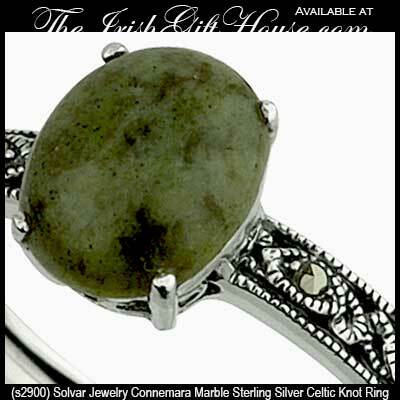 The Connemara marble Celtic ring is made by Solvar Jewelry in Dublin, Ireland.